The Bloomswell Diaries by Louis L. Buitendag. Review: Imagine your life, only two days after your parents leave you with your uncle, you read the newspaper with a nice cup of tea and see an article about your parents' death. 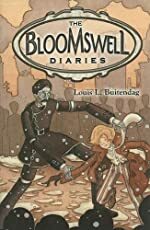 This is the life of Benjamin Sebastian Bloomswell in The Bloomswell Diaries by Louis L. Buitendag who is a great author who put many of the elements to create a great book into one. The story begins in England, a nice and cozy place to relax and enjoy yourself. Ben's life never happens to change though considering he isn't allowed to leave the house when his parents aren't home (which they never are). His parents always have important meetings to go to for business, ones that Benjamin cannot attend. Now, Ben's life finally has a chance to change as he must go live with his Uncle Lucas in New York City, while his sister Liza goes to Switzerland for a school. Benjamin has never been separated from his sister, and the only thoughts he ever has are about her and about his parents; he never worries about himself first. Then, one day, he gets taken by a police officer and is thrown in a mysterious building - one without any friendly invitation. Doors and windows are cracked and broken, there are creaky floorboards and stair steps - all the things you need for a haunted house. When Benjamin realizes he's in an orphanage, countless questions come to mind. How did it come to this? Why did he have to go to New York (the only question he wonders too)? How is his sister doing? Where is Uncle Lucas? The Bloomswell Diaries is a book that in not only filled with suspense, but it also incudes a little humor and plenty of imagery to make it feel like you are the main character. Once I started reading, I just couldn't stop! The book is very well detailed, creating strong mental images of all the places Benjamin visits throughout the book. This helps to make the story feel more realistic and compelling. The Bloomswell Diaries is an awesome book, and I would recommend it to any middle school reader. We would like to thank Kane Miller for providing a copy of The Bloomswell Diaries for this review. Have you read The Bloomswell Diaries? How would you rate it?